Application Control is a subscription for WatchGuard Firebox appliances that enables policy-based monitoring, tracking, and blocking of over 1,800 web 2.0 and business applications, including Skype, Facebook, YouTube, and many more. It relies on behavioral techniques and over 2,500 signatures to deliver enhanced security, bandwidth protection, and greater productivity. It’s never been easier to decide who, what, when, where, why and how applications are used on your network. WatchGuard Application Control tightens security across your extended network and adds productivity safeguards that go straight to your corporate bottom line. It enables IT administrators to easily monitor and control access to web and business applications, enforcing policies, increasing employee productivity, and protecting their networks from potential threats as a result of risky application usage. 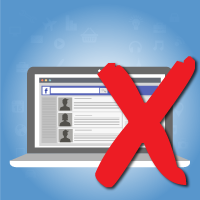 Administrators also have the ability to block sub-functions within applications, including file transfers, media and chat functions, and peer-to-peer connections. Applications can use a lot of bandwidth, limiting the available bandwidth for important business applications. Ensure dedicated bandwidth is available at all times for business-critical applications by setting throttle limits. Administrators can set throttle limits to ensure these critical applications are always available for the entire organization or even a specific group of employees.. Enforce policies on over 1,800 applications. Quickly and easily select to allow, block, or restrict access to applications based on a user's department, job function, and time of day using a centralized dashboard. WatchGuard Application Control gives administrators the granularity needed to meet their organization’s needs by enforcing specific policies per user or group. 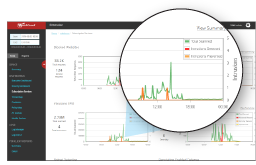 Get real-time and historical visibility into the applications being used on your network, including the top applications, categories, and user-specific data. You can also generate detailed reports for in-depth analysis across your entire network. Use this information to demonstrate compliance, evaluate employee needs, and refine acceptable use policies. 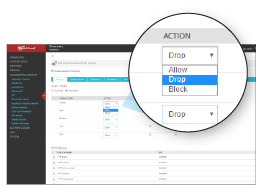 Application Control reviews traffic flowing through the Firebox and identifies traffic patterns that match a configurable application list. Application control then allows, denies, or throttles the connection based on policy configurations.